The sheer volume of data generated today and the number of apps and databases across enterprises is staggering. To stay competitive and get ahead in today’s marketplace, IT organizations are always looking at ways to optimize how they maintain and use the data that drives their operations. Faced with constant demands for more scale and reliability amid the ongoing threat of cybersecurity attacks, IT organizations can quickly stretch their staffing and infrastructure to the breaking point. In addition to these operational issues, businesses need to look at how to best harness their data to build better apps and fuel future growth. Organizations are increasingly looking for ways to automate basic database administration tasks, from daily management to performance optimization with best in class AI-driven intelligent PaaS capabilities. Azure SQL Database is the perfect choice to deliver the right mix of operational efficiencies, optimized for performance and cost, enabling you to focus on business enablement to accelerate growth and innovation. Azure SQL Database helps IT organizations accelerate efficiencies and drive greater innovation. With built-in intelligence based on advanced machine learning technology, it is a fully-managed relational cloud database service that’s designed for SQL Server databases, built to maximize application performance and minimize the costs of running a large data estate. The latest world-class SQL Server features are available to your applications, like in-memory technologies that provide up to 30x improved throughput and latency and 100x perf improvement on your queries over legacy SQL Server editions. As a fully-managed PaaS service, SQL Database assumes much of the daily administration and maintenance of your databases, including the ability to scale up resources with near-zero downtime. This extends to ensuring business continuity with features like point-in-time restore and active geo-replication that help you minimize data loss with an RPO of less than 5 seconds. And, it’s supported by a financially-backed 99.99% SLA commitment. The benefits of a fully-managed SQL Database led IDC to estimate up to a 406% ROI over on-premises and hosted alternatives, making it an economical choice for your data. DocuSign, the global standard for eSignature and digital transaction management (DTM), wanted to scale quickly into other international markets and chose Microsoft Azure as its preferred cloud services platform. Partnering with Microsoft meant combining the best of what DocuSign does in its data center, reliable SQL Servers on flash storage, with the best of what Azure could bring to it: a global footprint, high scalability, rapid deployment and deep experience managing SQL at scale. Check out this video to learn more about DocuSign’s experience. When considering a move to the cloud, SQL Database provides three different deployment options for your data, providing you with a range of performance levels and storage choices to suit your needs. Single databases are assigned a certain amount of resources via Basic, Standard, and Premium performance tiers. They focus on a simplified database-scoped programming model and is best for applications with a predictable pattern and relatively stable workload. Elastic pools are unique to SQL Database. While they, too, have Basic, Standard and Premium performance tiers, pools are a shared resource model that enables higher resource utilization efficiency. This means that all the databases within an elastic pool share predefined resources within the same pool. Like single databases, elastic pools focus on a simplified database-scoped programming model for multi-tenant SaaS apps and are best for workload patterns that are well-defined. It’s highly cost-effective in multi-tenant scenarios. We recently announced the upcoming fall preview for SQL Database Managed Instance, the newest deployment option in SQL Database, alongside single databases and elastic pools. Whereas single and elastic databases focus on a simplified database-scoped programming model, SQL Database Managed Instance provides an instance-scoped programming model that is modeled after and therefore highly compatible with on-premises SQL Server 2005 and newer, enabling a database lift-and-shift to a fully-managed PaaS, reducing or eliminating the need to re-architect your apps and manage them once in the cloud. With SQL Database Managed Instance, you can continue to rely on the tools you have known and loved for years, in the cloud, too. This includes features such as SQL Agent, Service Broker and Common Language Runtime (CLR). But, you can also benefit from using new cloud concepts to enhance your security and business continuity to levels you have never experienced before, with minimal effort. For example, you can use SQL Audit exactly as you always have, but now with the ability to run Threat Detection on top of that, you can proactively receive alerts around malicious activities instead of simply reacting to them after the fact. 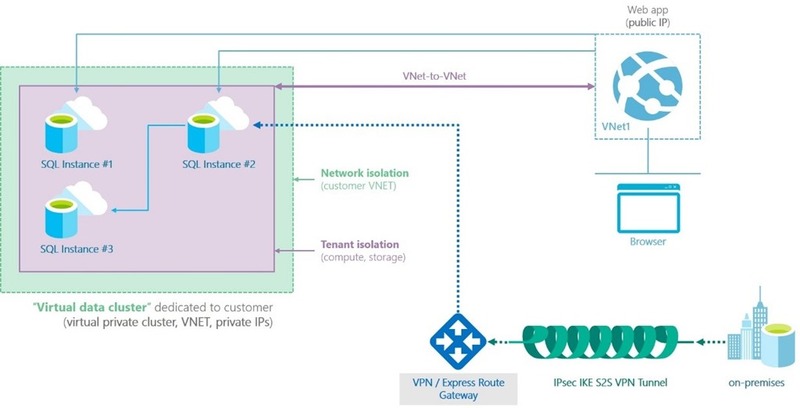 We understand our enterprise customers and their security concerns and are thus introducing VNET support with private IP addresses and VPN to on-premises networks to SQL Database Managed Instance, thus enabling full workload isolation. You can now get the benefits of the public cloud while keeping your environment isolated from the public Internet. Just as SQL Server has been the most secure database server for years, we’re doing the same in the cloud. For organizations looking to migrate hundreds or thousands of SQL Server databases from on-premise or IaaS, self-built or ISV provided, with as low effort as possible, Managed Instance provides a simple, secure and economical path to modernization. Managed Instance is built on the same infrastructure that’s been running millions of databases and billions of transactions daily in Azure SQL Database, over the last several years. The same mechanisms for automatic backups, high availability and security are used for Managed Instance. The key difference is that the new offering exposes entire SQL instances to customers, instead of individual databases. On the Managed Instance, all databases within the instance are located on the same SQL Server instance under the hood, just like on an on-premises SQL Server instance. This guarantees that all instance-scoped functionality will work the same way, such as global temp tables, cross-database queries, SQL Agent, etc. This database placement is kept through automatic failovers, and all server level objects, such as logins or SQL Agent logins, are properly replicated. Multiple Managed Instances can be placed into a so-called virtual cluster, which can then be placed into the customer’s VNET, as a customer specified subnet, and sealed off from the public internet. The virtual clusters enable scenarios such as cross-instance queries (also known as linked servers), and Service Broker messaging between different instances. Both the virtual clusters and the instances within them are dedicated to a particular customer, and are isolated from other customers, which greatly helps relax some of the common public cloud concerns. The new Azure Database Migration Service (ADMS) is an intelligent, fully managed, first party Azure service that enables seamless and frictionless migrations from heterogeneous database sources to Azure Database platforms with only a few minutes of downtime. This service will streamline the tasks required to move existing 3rd party and SQL Server databases to Azure. The Azure Hybrid Benefit for SQL Server is an Azure-based benefit that helps customers maximize the value of their current on-premises licensing investments to pay a discounted rate on SQL Database Managed Instance. If you are a SQL Server Enterprise Edition or Standard Edition customer and you have Software Assurance, the Azure Hybrid Benefit for SQL Server can help you save up to 30% on Managed Instance. Running your data estate on Azure SQL Database is like putting it on autopilot: we take care of the day to day tasks, so you can focus on advancing your business. Azure SQL Database, a fully-managed, intelligent relational database service, delivers predictable performance at multiple service levels that provide dynamic scalability with minimal or no downtime, built-in intelligent optimization, global scalability and availability, and advanced security options — all with near-zero administration. These capabilities allow you to focus on rapid app development and accelerating your time to market, rather than allocating precious time and resources to managing virtual machines and infrastructure. New migration services and benefits can accelerate your modernization to the cloud and further reduce your total cost of ownership, making Azure SQL Database the best and most economical place to run SQL Server workloads. We are so excited that these previews are almost here and look forward to hearing from you and helping you accelerate your business goals, and drive great efficiencies and innovation across your organization.